Depending on where you look there are quite a few different opinions on the origin of this style. What is widely agreed upon is that it came about in England in the early 1700s and was enjoyed by porters. Porters were people who “shifted packages for others” so something like dock workers or delivery boys I guess. They really enjoyed this style of beer and so it got named after them. It looks like Porter was either an evolution of a brown ale or a blending of a few different styles. The last bit of Porter style trivia is that after a few years of brewing this brewers began making it stronger and that developed into what we know now as Stouts but were originally called Stout Porters. Imagine that, naming a new style of beer instead of calling it Imperial/Double [insert style]. Pours a super dark amber brown that looks black at first sight. Plenty of nice thick tan topping that (I love alliteration) hangs out for a bit then drops down to a thin layer for the rest of the beer. The aroma is heavy on roasted coffee and chocolate malt flavors. Excellent tastiness featuring more coffee, chocolate, and roasted malts. Throws in a tiny bit of hop bitterness mixes in with the bitterness from the roasting and balances things out nicely. Insanely smooth and creamy mouth feel with a medium body. Overall it gives off a strong British vibe and is a decent beer. I’d prefer more alcohol and a heavier body out of something like this, but considering that this is THE STANDARD Porter (hell, it’s the BJCP’s first commercial example) such things shouldn’t be expected. Any store with a decent beer import section should have this on the shelves and I believe my buddy scored it for me at Jungle Jim’s but I’m not positive on that. I really enjoy your site whenever I see a review pop up on reddit. 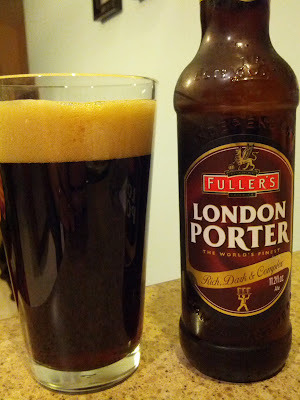 I must say, the Fuller’s is one of my least preferred varieties of porter. When I first began drinking quality beer, I would so very often discover disappointment when I ordered a Fuller’s thinking I was getting a Founder’s! It’s just a bit bland for my preferences. Anyway, thanks for sharing. I reviewed a seasonal from Abita over on my site. Check it out if you feel inclined and, of course, cheers!